Restoring distressed hair is no more a tiring task. Revitalize your tresses with L'Oreal Professional Serie Expert Absolute Repair Shampoo and solve all those dreaded problems. It nourishes your hair, repairs it and gives you dazzling hair that is easy to manage. Even the most damaged strands can now start bouncing with life and luster. This celebrated shampoo restructures your hair fibers by strengthening it from deep inside and also nourishes the surface adding sheen and shine. 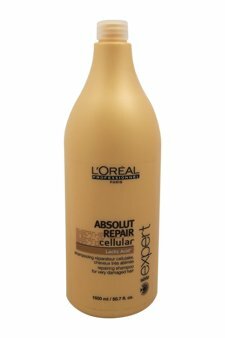 A Closer Look: L'Oreal Professional Serie Expert Absolute Repair Shampoo is formulated with Neofibrine, which mends the weak areas and enhances the shine. It also contains a UV filter that protects and shields your strands. Get Started: Apply to wet hair and lather. Rinse thoroughly. Repeat if necessary. PHYTO PHYTOCYANE Densifying Treatment Shampoo, 6.7 fl. oz.